“Ipe/Ipê”, pronounced “ee-pay”, refers to a species formerly from the genus Tabebuia (until 2007) and now in the genus Handroanthus serratifolia. In main plant records, Handroanthus serratifolia replaced the old name Tabebuia serratifolia. Other species of Ipe tree moved from genus Tabebuia to genus Handroanthus are H. guayacan and H. impetiginosus. The most common names for this tree species include ipê, poui, and pau d’arco. More recognized and popular names include Brazilian Walnut or Ipe, or a recently commercialized name of Ironwood. Ipe has also been referred to as Yellow Poui, Yellow Lapacho, Yellow Ipê, Trumpet Flower Tree, Mayflower, Pau d’Arco, Ipê-amarelo, and Pau d’Arco Amarelo. Further species of large timber types may bear the name Guayacan or Lapacho. Ipê has a buttressed and often straight trunk. Mature trees can reach heights of up to 30-40 meters or 100-150 feet high with the trunk reaching up to 3 meters or 4 feet in diameter. This size can provide up to 30 square centimeters of heartwood. The average dried weight is approximately 69 pounds per cubic feet or 1,100 kilos per cubic meter. On the Janka Hardness scale, it holds 15, 620 Newton or 3,510 pound-force with the specific gravity of 0.91 and 1.10 where 12%MC is basic. Ipê belongs to the deciduous types of large trees bearing profuse flowers in colors ranging from shades of yellow, lavender, white, red, and bright pink. It’s stunning to see during bloom. The fruits of the Ipê described as a capsule of a linear dehiscent form, contain winged seeds. Ipê’s fresh cut timber provides a yellowish-green heartwood with a creamy colored sapwood. After drying, the heartwood can range from a light to dark yellowish olive brown, a reddish brown, or even a blackish brown color. Primarily it displays a lighter brown with darker brown or black streaks. The sapwood, however, after drying appears white to gray-white in color. The texture of Ipê is fine to medium. The grain may vary from straight to interlocked or very irregular. Ipê belongs to a hardwood class that has a highly oily and resinous surface. This wood presents a slight natural luster but may have some yellow, powdery-like deposits in the wood. Ipê is native to the South American region but also comes as exotic from India and Kenya. It grows wild in the tropical forest area from Central to South America. But it’s also cultured in farm areas from Brazil and Bolivia to Colombia, and Trinidad and Tobago. The majority of Ipê is harvested from the forests of Trinidad and Tobago, and the northern area of the island’ and in Guyana. While Ipe thrives in most areas, it most commonly grows on the tops and sides of ridges. It does equally as well in the marshy or swampy ground and river banks. Ipê bears nearly every extreme and is known to be highly resistant to decay and insects. It is extremely durable, heavy, resilient, and dense, but these traits make it challenging to work with. It holds the Class A in fire rating, the same as concrete and steel. Being a super hard and strong wood makes it a perfect choice for flooring and decking. Its other common uses include turned objects, tiles, house posts, veneer, bridges, exterior lumber, sleepers, and tool handles. It also serves best when laid down for marina docks, fences, boardwalks, railings, and benches. Working with Ipê may cause eye, skin, and lung or nasal problems, depending on what one is doing. It may also trigger asthma-like symptoms, headaches, or disturbed vision. However, severe allergic reactions seem rare. Regardless of how dense, resilient, hard, and strong this wood is, it’s prone to marine borer attacks. The larger threat to this majestic species though has been harvesting. In the past, the bark was stripped from the living tree for its herbal properties. This practice nearly led to the species’ death but mass cultivation and proper conservation efforts have helped combat this problem. Agencies like the Rainforest Alliance and other NGOs worked hand-in-hand to help conserve and sustain the Ipe tree species. Due to strictly enforced forest management plans and continued Ipê replanting, the species survived the threat of extinction. As of now, Ipê appears on neither the IUCN Red List of Threatened Species nor in the CITES Appendices. Contact us at Woodrich Brand for more info on the best finish, as well as the best wood cleaners for Ipê. You may also read our blogs about the projects done with Ipê decks. We’re always ready to serve you, so visit our Facebook page or call us now! 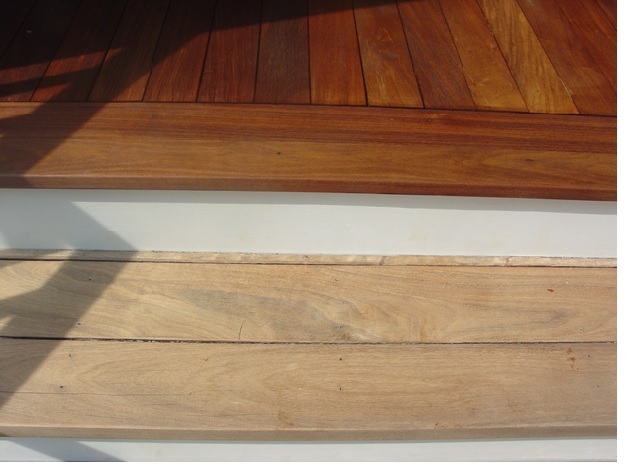 This entry was posted in General, Wood of the Week and tagged clean, deck, fence, stain, strip.